Did you know there is a gadget to manage all of your cards in your wallet? Today, I finally review the Coin. In the last two posts, I discussed a number of ways to make your wallet smaller and remove all of the receipts and notes making it a little bit slimmer. In this final post, I talk about the Coin. I originally purchased the Coin back in 2013 (as noted here). Of course, since it was a crowdfunded effort, I wouldn't see the final product until it was manufactured and shipped. Fast forward to 3 months ago. I received my Coin in the mail. A month ago, I started using it around town. The Coin is a small plastic card that can store up to eight cards on one single Coin. Basically, any type of card that has a scan-able magnetic strip on the back can be used by Coin. 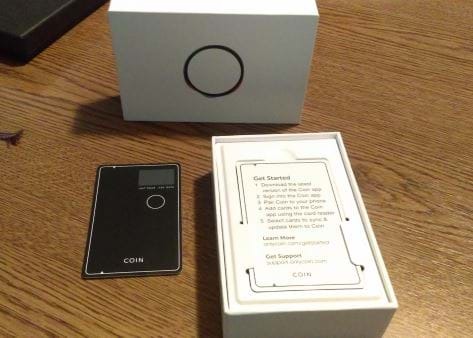 When you receive your Coin, you get a card reader that attaches to your phone so you can slide the card through the reader and the Coin app on your phone reads the card and encrypts it. The phone app is available for iPhone and Android. 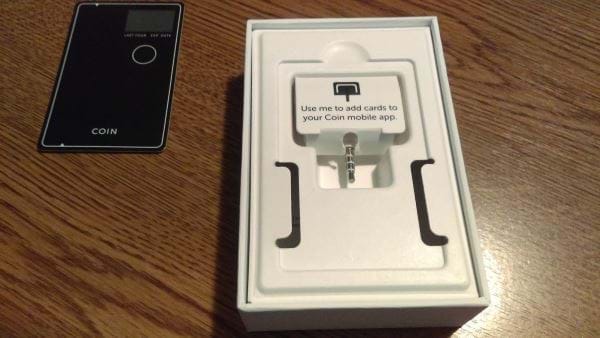 However, there is a limited number of devices that the Coin supports. For Android, they are listed here and for iOS devices, they are listed here. The phone and Coin are inseparable. One cannot live without the other. It stands to reason because you always have your wallet with your phone, right? The app can hold an unlimited number of cards, but as I mentioned above, the Coin can only hold eight. Once you receive your Coin, you need to download the app. The app is what reads the cards and transfers the encrypted data to your Coin. Once you have all of your cards on your Coin, you are ready to go. When you are ready to pay using your Coin, you push the button on the card. This displays a LOCK in the display window. This means it's connecting to your phone to establish a connection that you are who you say you are. If the LOCK doesn't disappear, it means that you have your phone's Bluetooth turned off or the phone isn't within reach for the Coin to deactivate. 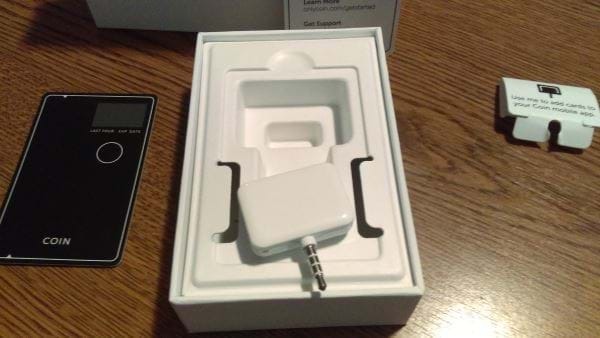 After it finishes connecting, it will display the first card you scanned. Press the button again to move to the next one. Continue pressing the button until you find the right card. When you reach the end, it will cycle back to the beginning. After using Coin for the last month, there are a number of places I've tried and about 25% of them have failed to read the card. At certain ATM machines, it said it was an "invalid card. Please use another card and try again." While the card doesn't work 100% of the time, it does relieve my wallet from having all of those other cards available with me at all times. Once the cards are entered into the app, it's extremely easy to download them and sync them to the Coin. They recently just announced a couple of updates for their new Coin 2.0 when it's released in 2016. If you have Coin 1.0, you will be upgraded to the Coin 2.0 for free as a way to say thank you to their existing users. Coin 2.0 will utilize EMV (short for Europay, Mastercard, Visa) which is the latest security protocol for payments designed to reduce fraud. Until 2016, I will be looking around and try to find other locations where I can use Coin. If you have any questions about the Coin, you can view their Coin FAQ page. Coin is definitely a welcome addition to my wallet because it cuts out all of my other cards. Although, there is one tip I would recommend users of the Coin: Keep at least one debit card and/or one credit card in your wallet just in case a merchant doesn't support Coin. There are individuals behind the register who may raise an eyebrow when you have this black card that imitates other credit cards. Just sayin'. Overall, I love my Coin and will be using it continuously (so long as it holds up over time). Looking to buy a coin? Head over to Coin and get one quick before 2.0 comes out. I want a Coin.